Its quite possible to indulge in an elegant, intimate meal … in a shopping mall. A FRIEND remarked not too long ago that finding a good steak in Kuala Lumpur was becoming increasingly difficult. That sparked off a friendly debate of sorts as everyone jumped in, offering their two cents worth on whats a good bite of beef. There are so many new restaurants in town, so surely there has to be some good steak to be had out there, no? Well, apart from dining at pricey five-star hotels, admittedly, a good old-fashioned piece of meat, minus the fancy fusion trimmings, isnt all that easy to come by anymore. And so it was a pleasant relief to find that the hunt for red meat was naught to waste, as Svago proved the notion of a good steak in KL is alive and well. Much like a fine garment, it may look deceivingly simple, but in truth, it takes an expert to produce the perfect cut, flavour and texture. Located above its sister Italian restaurant Limoncello, overlooking the picturesque Suria KLCC fountain, Svago (Italian for leisure) reveals a very different universe altogether when you ascend the timber staircase. In fact, its quite possible to miss the establishment altogether since you tend to notice the name only after the first flight of stairs. While the street level Limoncello is more casual, popular with walk-in shoppers and tourists, Svago borders on fine dining with its intimate ambience, housed in an elegant, spacious Art-deco setting. The Premium Salmon Mousse could have come with a few more blini. Warm wooden panels and ceramic brick-clad columns reminiscent of rich European styling juxtaposed against the stark black and white chequered tiled floor; the bronze and stainless steel ceiling over the inviting bar, the attention-grabbing overhanging globes of light over the table tops … all these details and more are the work of renowned designer Chris Lewis. Meant to complement Chef Felice Martinellis continental cuisine with a hint of Italian, the classy interior along with the jazzy live music in the evenings make it easy to imagine that youre dining elsewhere in the world other than one of KLs busiest shopping malls. Dinner began with the Grilled Whole Portobello Mushroom (RM32.80), marinated in herbs and extra virgin oil, accompanied by a small portion of fresh rocket salad. There was no secret science to this, as the taste was clean and true, and the juicy mushroom had a good burst of flavour. Wish there was more of it though. The Premium Scottish Smoked Salmon Mousse (RM48) with cream cheese, ricotta and mascarpone had bits of salmon, which added texture to an otherwise predictable mushy concoction. Light and refreshing, this came with three blini (small thin pancake). The only complaint was that there wasnt more of the wafer-like blini which went well with the mousse. The delectable Escargots a la Bourguignonne (RM38.80) baked in light, basil herb butter was a nice change from the usual rich, cheesy version, and definitely worth the extra calories. Svago boasts a fine selection of seafood and meats so I shouldnt have been surprised to see my pasta buried in what looked more like a generous seafood platter. Usually the squid ink would be mixed together with the cream sauce, leaving ones teeth covered in unattractive black sauce. However, this version had the ink premixed with the noodle, and seemed almost Oriental in its presentation. Tossed lightly in spicy aglio sauce, the house-made noodle retained a nice springiness and the grilled seafood was fresh to the taste. The Wagyu Beef was cooked simply and without frills, and was moist and succulent. Back to the steak. The proof is in the eating, they say, and the Wagyu Beef did not disappoint. When asked how we wanted it done, my dinner companion, Mac, quipped medium rare, while I said medium well done (sacrilegious to beef lovers, I know, but I confess Ive yet to learn how to truly appreciate blood-stained meat). In the end, we left it to the chefs recommendation and it came out medium. Frankly, it had not occurred to me how medium done beef could be so fractionally different until now! It was well worth the friendly dispute, as the result was a premium cut beef that was still a touch firm, yet tender enough to fall apart at the slightest insistence of the knife. In all appearances, it was cooked simply and without frills  still moist and succulent  but the texture was just right, yielding a flavourful mouthful with every bite. But while I wax lyrical about the beef, it was really the Seabass that got me hook, line and sinker. Forgive the cliché, but it was impossible to resist the smooth, buttery fish, ever so lightly pan-seared, despite feeling stuffed by then. No matter, theres always room for dessert, and the dark and intense chocolate lava cake made a fitting end to a satisfying dining experience. 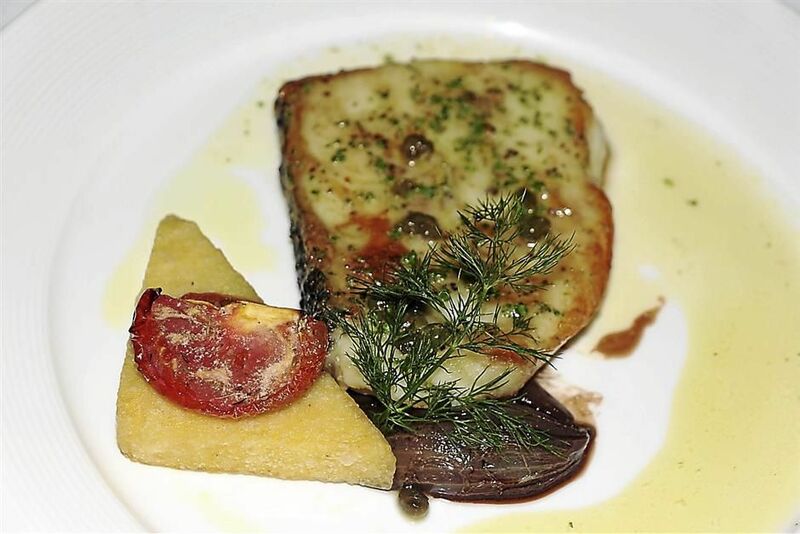 The Seabass at Svago is lightly pan-fried and comes with polenta. Its accompanied by a unique sauce made by the chef. Much thought has been given to Svagos cuisine as each dish came carefully prepared with its own identity and nuances. However, prices can be a little daunting should one choose to dine here frequently. I hear Svago also has a commendable Beef Carpaccio Cipriani (Martinellis specialty) and is acclaimed for its Seafood Bouillabaisse, apart from a bespoke menu of meats and seafood from which you can choose a wide range of 16 different cooking styles. Thats quite a tempting menu and surely warrants another visit. * Prices for the main courses vary according to weight/catch of the day.